Rick was able to try out Nikon's new FX lenses, the 28-300 AFS VR and the 24-120 f/4 AFS VR. Jason is leading a photo workshop to the Everglades in 2011. Announcing Jason's Everglades Photo Safari March 13-17, 2011. Nikonians Members get two exclusive deals for the Fall season; first up - USD30 off any and all services at ScanCafe, so start preserving those films and emulsions! And Berger Brothers is offering a 10% discount for any Manfrotto and Gitzo tripods for the month of November only! 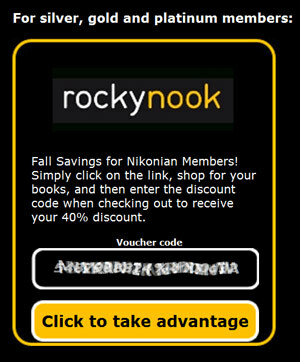 Remember, you can only get these vouchers at Nikonians Rewards! Jason and Rick are back from their Moab photo safari. This week the doctors discuss Nik Software's new HDR Efex Pro plug-in with product manager Josh Haftel, and Jason has a hands-on report of the new Coolpix P7000. For our members looking to get a head start on operating the latest DSLR arrival, Nikon has now put up the D7000 Digitutor site for your perusal. Enjoy! Beta testing of ACD Systems International's ACDSee™ Pro Photo Manager for Mac is heading into its final phase and introduces professional photographers to one of the software's most robust features: non-destructive editing. Beta 1.4 downloads of ACDSee Pro for Mac, which gives photographers a faster all-in-one photography workflow system, are now available at www.acdsee.com/proformac. To date, more than 10,000 Mac users have participated in the beta program and have offered feedback in 153 forum topics to ACD Systems developers. The final version is anticipated for release in early 2011. "This final beta phase is an opportunity for photographers to test the features that will make ACDSee Pro for Mac a powerful workflow tool, particularly the non-destructive editing capability," said Tarjin Rahman, product manager for ACD Systems. "Testers will be able to edit images without needing to save new files, which is a huge time-saver." • An improved graphical user interface for Process mode. • The ability to easily copy and paste processing settings from one image to another. • Metadata is compliant with the Metadata Working Group (MWG) and supports IPTC Core, Extended and IIM. • A Custom Metadata pane allows for presenting a specific set of data that is most important to the user. 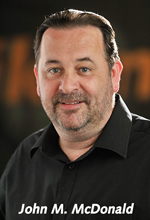 Between the beta 1.4 test period and the final release date in early 2011, Simon Tipler, project manager for ACD Systems, said the company's developers will be implementing user feedback, adjusting features and performance to streamline the workflow process, and performing quality checks. "We know photographers who use Mac systems are eagerly anticipating Pro for Mac because they have been integral to its development," said Rahman. "They will be very pleased when they see the final product." ACDSee Pro for Mac is in beta testing at www.acdsee.com/proformac. 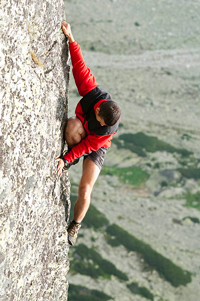 The full release of the product is anticipated in early 2011. 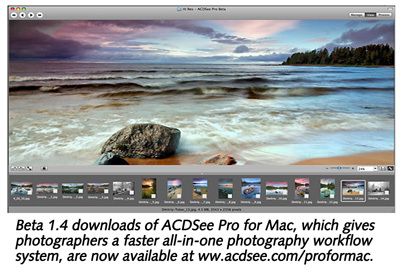 At that time, ACDSee Pro for Mac will be available for a free 30-day trial and for purchase at $169.99 (USD) by visiting www.acdsee.com. For most photographers, a telephoto lens is like a specialized tool; you don’t often have need for it, but when you do, you want it to work right the first time. Tamron’s latest telephoto zoom, the SP 70-300 f4-5.6 Di VC USD, is exactly that – a very useful lens that gets you the shot you want when you need it. Editor's Note: The Samples Gallery is now available. Tamron is no newcomer to the market. As a third-party manufacturer of still camera and video lenses, the company has been making optical products since 1950. The new 70-300 VC USD reflects their long history and experience in its’ build, handling and performance. Ultrasonic Drive (USD) - this is Tamron’s first lens to use a coreless drive motor. Much like Nikon’s Silent Wave motor, the lens is not dependent upon the camera’s internal shaft drive to move the optical elements. Instead, Ultrasonic Drive pulls battery power from the camera and uses a ring motor to silently and swiftly arrive at the desired focus. It’s perfect for fast moving action but discreet enough in events requiring a low noise profile. *If your subject is moving at a pace faster than the shutter speed can freeze the action, it will still be blurred. Optical Formula – the new lens features an LD (Low Dispersion) and an XLD (Extra Low Dispersion) optical element that helps prevent chromatic aberration (the so-called “purple fringing” effect). The optical formula of 12 groups in 17 elements is considerably more complex compared to Tamron’s previous implementations – the AF 70-300 Macro and the AF 75-300 Macro LD both had 9 groups in 12 elements, and only a single LD element each. Di Type – Tamron applies a multi-coating to optimize the lens’ use with more reflective Digital SLR sensors, although it is fully compatible with film cameras as well. The build is quite modern and reassuring. Although it is mostly composed of light-weight materials and a metal mount, the lens is hefty at 1.7 lbs/0.7 kg and feels solid. There is no creak or give whatsoever, and when extended to its full length at 300mm, the lens barrel does not flop or bend. Tamron also includes a deep bayonet-mounted flower-petal hood that is reversible for easy storage. The hood’s length is great as it increases the efficiency of glare reduction. A proprietary rear cap and a pinch front cap round out the package. The pinch cap is very convenient, and is easily mounted and removed even with the hood in place. The filter size is a common and relatively inexpensive 062mm, which is great for photographers on a tight budget. The lens has the normal seals against dust and dirt, but is not waterproof. The lens has no dedicated aperture ring. Like its modern peers, the mechanical linkage of aperture is now electronically controlled through the lens mount interface, allowing the photographer to set the opening via control dials on the camera body. There are two ring controls – a very large zoom ring dominates the front two-thirds of the barrel length, while a narrower but easily handed focus ring is placed closer to the mount. The focus ring adequately allows clearance even for larger hands, so you won’t feel cramped while trying to manually focus. A display window on the top closest to the lens mount end shows focus distance in feet and meters. The rings are mechanically sound – both turned with a crisp reassurance, but were tight enough that with some practice, you could move the zoom ring by “feel” to a given focal length and know it would stay there. It takes about a quarter turn to cycle through the whole zoom range. Because of the full-time AF manual override, the focus ring turns freely in either direction and does not hit a stop or detent. Those of us who have struggled with “switchology errors” on lenses will be pleased to see the simplified setup Tamron has created – there’s just two switches, both on the left side; one turns VC ON or OFF and the other switches AF ON or OFF. That’s it. For folks who like to delve into the technical details, it sounds suspiciously like Tamron’s implementation is too simplified, but be reassured, it’s not. We’ll get into that later in this review. In the field, the lens handles as well as it looks. On lighter bodies such as the D40 or the D3000, the feeling is a little nose-heavy, but using enthusiast and pro cameras like the D200 and the D2 series, the result is a nicely balanced combination. The hood’s length provides a reassuring protection from foreign objects (and kids’ sticky fingers!) as well as glare reduction. I was even able to reach in and manipulate a circular polarizer, but if you have smaller hands, results may vary. The Ultrasonic Drive was noiseless, and I could not distinguish any difference between its operation and Nikon’s Silent Wave. Autofocus operations were very responsive. The lens locked on to the subjects accurately and with no hesitation. If you’ve never used coreless drive lenses before, you might be slightly surprised the first few times; when looking through the viewfinder, it feels like the image “jumps” into focus because you don’t get the aural feedback from the shaft-drive motor. 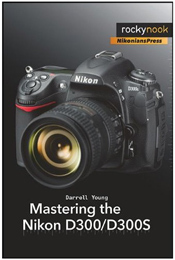 Full-Time manual focus is available by simply grabbing the focus ring and overriding the AF system. Many of you have been waiting for this section. So let’s get right into it; the Vibration Compensation works and works well. End of statement. That’s the short story. In typical optical stabilization models, most manufacturers have two modes, one to accommodate normal use – removing up-down and left-right, and another to remove all movement entirely. These modes are defined by a hardware switch on the lens. Most lenses are also equipped with only two axis sensors inside the lens to detect and compensate for those movements. Tamron upped the game by providing a three-axis (i.e., three-coil) system. That means Tamron’s implementation of image stabilization compensates not only for up-down (oscillation) and left-right (lateral) movements, but also compensates for yawing (up-left, down-right), all in a single mode. Think of a “+”sign superimposed over an “x” sign. For those of you who like to pan, there’s nothing to worry about; the three-coil system detects the movement for panning accordingly and only compensates for the up-down and yaw movement. End-result - you don’t have to think about which mode the lens is in, and can concentrate on other aspects of the photo-taking. As I mentioned earlier, some of us who like to get down into the technical details would be suspicious of a single setting for such a complex operation, but Tamron’s design is simple, efficient and elegant. Some handling steps that everyone should be aware of when using VC. First, there is no tripod detection mode, so VC should be turned OFF when mounted on a stable support. Secondly, the use of AF-ON button will not activate VC, only the half-press of the shutter button will. VC is more useful when it has more information about the motion it needs to compensate for, so begin the tracking process with the half-press as soon as you possibly can. And VC really works. The first time you enable it, the image locks down. At low shutter speeds where handshake would be noticeable through the viewfinder, the image stops moving, period. Absolutely stunning and puts VC very much a leg up on Nikon’s Vibration Reduction – in VR, you will still see the image “drifting” even at shutter and ISO combinations where VR is effective – that’s the most noticeable difference in a two-coil versus three-coil implementation. VC effectiveness lives up to the four-stop specification. My worst cases were a harvest moon at ISO 100, handheld, varying the apertures to get a properly exposed shot. At 1/30th of a second, I was getting very usable photos of the moonscape. In normal use during daylight and low-light scenarios, both the VC and USD functioned perfectly in conjunction with each other. In situations where I would have boosted the ISO just to get a higher shutter speed, I simply flicked the VC switch to ON and kept shooting. The image quality of the lens is equally impressive. 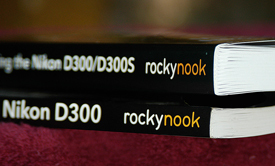 The test cameras were a D200 and D2H, using NEF format. The default color mode selected was Mode I, which savvy post-processors know tend to be low contrast and low saturation in order to maximize for skin tones. But even straight out of the camera, you could already see the rich color fidelity in many signage and street shots. Sharpness was set to Low, but the NEF files already showed depth and detail even without any optimization, such as the architectural details close-ups during a stroll in historic downtown Newport. The LD and XLD elements were doing their job, enhancing contrast and color even on rainy and overcast conditions during a Hurricane Earl photo-trek. I wasn’t able to invoke Chromatic Aberration at all during high-contrast shooting. The nine-blade aperture produced very acceptable bokeh, nicely rendered with no sharp points. During the 2010 Photokina in Cologne, Germany Epson had plenty to show at their booth and for those of you who missed it, we're providing the following brief re-cap (and links) . Epson® launches the Stylus Pro 4900 – a compact, 17-inch production printer setting new standards in colour precision for the photography market. Delivering the best print quality for commercial photographs and fine art reproduction, the printer boasts outstanding colour consistency and accurate colour matching, and can reproduce 98% of PANTONE®1 colours. 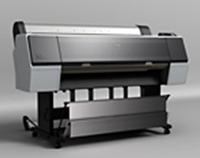 Building on the success of its quality-assured Digigraphie print solution, and responding to its customers’ requirements for a dedicated, high-quality fine art and photography media range, Epson has launched its Signature Worthy brand; a way for users to clearly identify the products in its premium media line-up.